Prices for goods and services used in construction climbed 6.2 percent over the past year and are intensifying a cost squeeze on contractors coping with widespread labor shortages, according to an Associated General Contractors of America analysis of new Labor Department data, including Producer Price Index (PPI) figures tracking an August 2017–2018 trajectory. A diverse range of products outside of cement and concrete contributed to the year-over-year cost measure, notes Simonson, who points especially to Labor Department figures for diesel fuel, up 33.9 percent; steel mill products, up 18.6 percent; aluminum mill shapes, up 14.0 percent; asphalt paving mixtures and block, up 9.2 percent; and, gypsum products, up 8.2 percent. Among services used in construction, the price index for truck transportation of freight climbed 7.2 percent. Over same 12-month window, the PPI shows portland cement and concrete products prices up 1.9 percent and 3.6 percent, respectively. The latter figure factors increases for concrete block & brick (2.4 percent); pipe (1.5 percent); ready mixed (3.7 percent); precast (3.8 percent); and, prestressed (4.8 percent). The PPI for inputs to construction industries—a weighted average of all goods and services used in building and nonbuilding segments—declined 0.8 percent from July to August but jumped 6.2 percent since August 2017. In contrast, an index that measures what contractors say they would charge to erect five types of nonresidential buildings rose 3.4 percent over the year, indicating that respondents were absorbing more of the costs than they were passing on to owners. 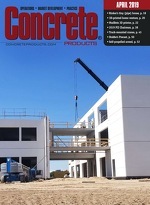 A new report, “Global Precast Construction Category – Procurement Market Intelligence,” documents how public and private sector buyers are increasingly wise to manufactured-concrete components’ low lead times, assurance of consistent quality, higher volume discounts, low labor requirements, and conformity to sustainability goals. Such advantages are accelerating the spend growth momentum for the precast market, according to global procurement advisor SpendEdge. The construction industry is heavily dependent on raw materials, the report notes, while knowledge of key factors that influence precast concrete material prices guides construction buyers to devise a cost-efficient and optimal supply resource. SpendEdge sees the following factors driving a global category spend for precast concrete and construction methods: Lower production expenditures, plus components’ strong seismic resistance, excellent thermal performance and low noise transmission.